Sunglasses are a fashion accessory. As with any consumer product, creating an effective POP display is critically important to maximizing sales. However, what’s interesting about the fashion accessory category in general and the eyewear category in particular is that relative to other consumer products, the point-of-purchase display plays an extraordinarily important role in creating perceived product value. If for example, you see a bagged coffee display in a grocery store, no matter how nice the display, you still have a pretty good idea what the bag of coffee will cost. On the other hand, if you put a $2 pair of sunglasses on a high-end sunglass display, the customer could easily think the glasses are significantly more expensive since the high-end display creates greater perceived value for the sunglasses. Not all sunglass displays need to be high-end, but creating a retail display that can effectively merchandise your eyewear is incredibly important. In this blog post, we’ll focus on high-end sunglass displays. In Part II of this series, we will share some inspiration for creating high end sunglass displays. In Part III we will focus on mid-range sunglass displays, and in Part IV we will focus on economy sunglass displays. So how do you create an effective high-end sunglass display? The first decision you need to make is whether or not you want to have some sort of locking case for your display or if you want to create a non-locking display. The benefit of a locking display is two-fold: (1) theft prevention, and (2) higher perceived product value since most shoppers realize that cheap sunglasses are generally not locked up. The downside of a locking display is that it is much more difficult for the consumer to try on the sunglasses and generally access to the product is dependent on available store personnel. Ojos Eyewear was looking for a distinctive locking floor display to showcase its new line of eyewear. We designed a fixture made of distressed, rough sawn barn wood with a locking acrylic upper case and a locking storage area for stock below. The back LED panel provided backdrop lighting and floating shelves put the focus on the sunglasses. The metal corner accents help to reinforce the vintage look, and the acrylic header with dimensional letters helped to reinforce the Ojos Eyewear brand. 9Five Eyewear is a high-end brand of eyewear created to appeal to a prospective customer base associated with street culture, skateboarding, and fashion. Its target customer is 18-24 year old males. We created a unique locking case display for them that looked like a video game console, fully equipped with push buttons, a real joy stick, and coin slots. 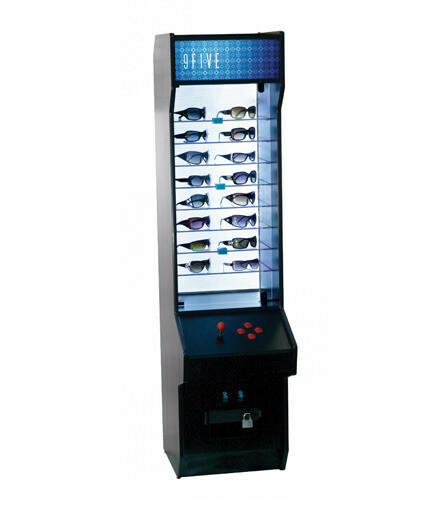 The display was designed to tap into the passion that 18-24 year olds have for video games while also creating a completely unique display within the eyewear category. The display was constructed of MDF with a black laminate finish, a clear acrylic front, glass shelves, and an LED lighted back panel. We also designed an equally unique counter-top display for 9Five. The display was created out of a carrying case and had a locking pop-up display module which feature its full line of sunglasses. The display featured a mirror with prominent 9Five branding. The pop-up case proved to be a unique and effective way of merchandising sunglasses on the counter top. Kroop’s Brands makes high-end googles and sunglasses for horse racing, skydiving, bicycling, and other sports. They asked us to design a goggle and sunglass display to appeal to jockeys and the broader horse racing community. We designed a simple wooden case with clear acrylic sides and an angled sheet metal top complete with a decorative horse racing weathervane with their “1947” branding which was the year of their founding. The display included 2 glass shelves and a 1-color logo imprint on the front door. We also designed a solid wood crate display for sunglasses and googles. The display featured a rugged crate look with 2 glass shelves, a locking acrylic front door and silk screened branding on the sides and front.